With the 2017 product starting to land at BMX shops and mail-orders worldwide, it’s a perfect time to take a closer look at all of the new frames and parts that Mutiny Bikes have to offer to their line up! As always, Mutiny did an amazing job of creating a line that is not only strong, but aesthetically pleasing, too. They also have avoided having a massive line of products, by only creating products that they feel they can offer something of value, versus just pumping out every part possible and slapping a Mutiny logo on it. You can get a full look at everything with photos, full specs and details below! Let’s start things off with the frames and bars. The Jeff Wescott signature Comb frame is looking dialed with a fresh coat of Honey Red paint. This frame is made from 4130 Sanko chromoly tubing with a 74.9-degree head tube angle, 71-degree seat tube angle, 11.8″ bottom bracket height, 9″ standover height and a 13.2″ – 13.75″ chainstay length. You can find a taller 125mm Integrated, offset thickness head tube that is heat-treated for additional strength, top and down tube gussets with the debossed “Badge ‘N Bones” logo, double-butted top tube, straight gauge elliptical down tube to help resist denting, a heat-treated Mid bottom bracket, integrated seat post clamp with the horizontal cut for better clamping with less torque, a custom seat stay bridge, 6mm thick dropouts with integrated chain tensioners and removable brake mounts on the seat stay. The 2017 Comb frame comes in Honey Red for the only color with 20.8″, 21.1″ and 21.3″ top tube lengths! Offset thickness, 125mm tall integrated head tube. The offset thickness allows for a stronger weld where the top and down tubes and gussets meet the head tube to help resist cracking. Custom seat stay bridge and an integrated seat post clamp with the horizontal cut for better clamping with less torque on the frame. 6mm thick dropouts with integrated chain tensioners. The brand new Dylan Lewis signature Death Grip frame has been getting plenty of buzz thanks to the past few months where Dylan really caught everyones attention at the Van Doren Invitational and Battle of Hastings contests. The Death Grip is made from full 4130 Sanko chromoly tubing with a 74.5-degree head tube angle, 71-degree seat tube angle, 11.65″ bottom bracket height, 9.15″ standover height and a 13.7″ – 14.2″ chainstay length. You can find the offset thickness, heat-treated, 125mm tall Integrated head tube, top and down tube gussets with the Badge ‘N’ Bones logo, a triple butted top tube, double butted down tube, heat-treated Mid bottom bracket, Integrated seat post clamp with the horizontal cut to give better clamping with less torque, 6mm thick dropouts with Integrated chain tensioners and removable chainstay brake mounts. 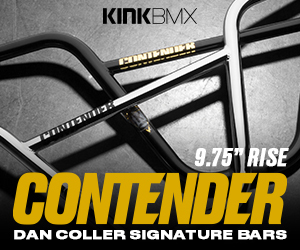 The Death Grip frame comes in Gloss Raw for the only color with top tube lengths of 21.3″, 21.6″ and 21.8″. This frame is ideal for the taller rider or somebody who loves roasting trails or transitions without the fear of looping out. Offset thickness, 125mm tall, heat-treated, integrated head tube with the top and down tube gussets creating a strong front end. Custom seat stay bridge with the Mutiny logo and the integrated seat post clamp with the horizontal for better clamping with less torque. Next up, we have the Grant Castelluzzo signature Obscura frame. Once again, Mutiny and Grant came up with an amazing color for the frame. The Obscura frame is made from full 4130 Sanko chromoly tubing with a 75-degree head tube angle, 70-degree seat tube angle, 11.8″ bottom bracket height, 8.95″ standover height and a 12.75″ – 13.6″ chainstay length. The frame has the offset thickness, heat-treated, 125mm tall Integrated head tube with top and down tube gussets with the debossed Badge N Bones logo, a double butted top tube, straight gauge elliptical down tube to help resist denting, heat-treated Mid bottom bracket, Integrated seat post clamp with the horizontal cut to give better clamping with less torque, a custom seat stay bridge with the Mutiny logo and 6mm thick dropouts with the Integrated chain tensioners. This frame is completely brakeless, so there are no mounts. The steeper head tube, higher bottom bracket and shorter chainstay length makes for a responsive frame that’s ideal for technical street riding. Custom seat stay bridge with the Mutiny Bikes logo and an integrated seat post clamp with the horizontal cut for better clamping with less torque on the frame. 6mm thick dropouts with the integrated chain tensioners. The latest version of Tom “Robbo” Robinson‘s signature Villij frame has arrived. This frame geared toward cruising the trails in the woods has a few unique features not found on the other frames we have looked at. The frame is made from full 4130 Sanko chromoly tubing with a 74-degree head tube angle, 71-degree seat tube angle, 11.8″ bottom bracket height, 8.6″ standover height and a 13.6″ – 14.1″ chainstay length. You can find the offset thickness, heat-treated, 125mm tall Integrated head tube with a down tube gusset with the Badge N Bones logo, a triple butted top tube, double butted down tube, heat-treated Mid bottom bracket, Integrated seat post clamp with the horizontal cut to give better clamping power with less torque, a custom seat stay bridge with the Mutiny Bikes logo, bullet tipped seat and chain stays, 5mm thick dropouts and welded on chainstay brake mounts. The 2017 Villij frame comes in flat gray for the only color with 20.75″, 21″ and 21.25″ top tube lengths. This is a trails riding machine, but can hold up to some heavy street riding, too. Offset thickness, 125mm tall, heat-treated, integrated head tube with a down tube gusset to help create a strong front end. Custom seat stay bridge with the Mutiny Bikes logo and integrated seat post clamp with the horizontal cut to give better clamping with less torque on the frame. You can find bullet tipped seat and chain stays leading to the 5mm thick dropouts. That’s the 2017 frames from Mutiny Bikes, now, hit the link below to check out all of the 2017 parts from the bars and forks all the way down to the headset and cable ties! Click here to view 2017 Mutiny Bikes Parts!